Brush your teeth at least twice a day, with a soft-bristled toothbrush and a non-abrasive, fluoride toothpaste. Avoid abrasive toothpastes with extra ingredients, such as those for tartar control or whitening. You may have to hunt through many "whitening" toothpastes to find one with no whitening ingredients. Brushing is essential to healthy teeth and gums. Proper brushing removes plaque, a sticky and acidic mix of bacteria and biofilm, which causes cavities. The toothbrush should be placed against the teeth at a 45-degree angle to the gum line. Floss at least once a day, preferably before bedtime. Flossing removes food particles and plaque from between the teeth, where decay frequently begins. Move the floss up and down, curving it towards the side surface of the tooth on one side of it, then towards the side surface of the other. To avoid injuring your gums, floss gently against the gum line. Use about 18 inches of floss each time, and use a fresh part of it for each between-teeth area. Rinsing with an alcohol-free mouth rinse can help to eliminate the bacteria and biofilm in other parts of your mouth that brushing and flossing do not reach. After a snack or meal away from home, it can be beneficial to rinse with water if you cannot brush or floss. Chewing sugar free gum for 20 minutes after meals is another proven way to prevent tooth decay. This is because the chewing gum stimulates saliva flow, washes away food debris, neutralizes acid, and may reduce the decay-causing bacteria in the mouth. Eating a diet high in fruits, vegetables and whole grains and low in sugar and starches is good for your dental health. Sugars and starches produce acids that remain in the mouth longer and will dissolve tooth enamel. So it is especially important to eat less sugar and starch to keep your teeth and gums looking and feeling great. This includes limiting foods such as candy, cookies, cake, fruit snacks, raisins, chips and crackers. For beverages, water is best. Avoid high sugar drinks such as juice, soda, sweetened teas and coffees, and sports drinks. 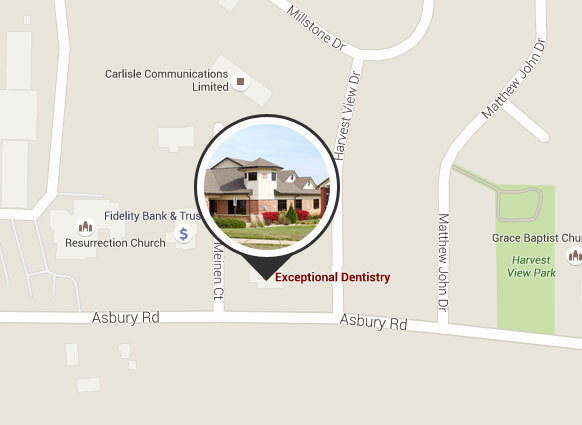 Visit Exceptional Dentistry about every six months for a thorough dental checkup and cleaning. This will keep your teeth and gums strong and healthy. If you experience anything unusual, such as bleeding or swollen gums or pain, call us immediately. This may indicate periodontal disease. A healthy, attractive smile that lasts a lifetime begins with prevention. At Exceptional Dentistry, our hygienists regularly educate parents and children about proper daily oral hygiene. When you speak with one of our hygienists, you will learn more about what good hygiene is, why regular cleanings are necessary, and what will take place during a checkup. Please email our friendly family dental office or call 563-556-2711 to schedule a dental checkup at Exceptional Dentistry, serving Dubuque, Dyersville, Cedar Rapids, Davenport, Iowa and Galena, Illinois.